Noida: The much-awaited metro line linking the twin-cities of Noida and Greater Noida in Gautam Buddh Nagar was inaugurated on 25.01.2019 by Uttar Pradesh Chief Minister Yogi Adityanath. The metro services opened for the public on next day. The metro corridor, also known as the Aqua Line, would run between Sector 71 station in Noida and the Depot Station in Greater Noida. There are a total of 21 stations on the corridor – 15 of them in Noida and 6 in Greater Noida — spread over a distance of 29.7-km. 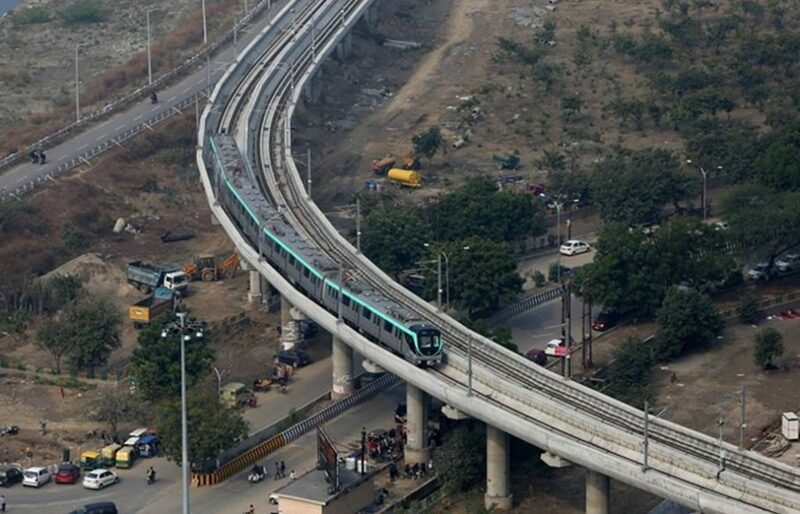 The final and mandatory safety inspection of the corridor was done in December last year by the Commissioner of Metro Rail Safety (CMRS) which gave its approval to the Noida Metro Rail Corporation (NMRC) for launching commercial operations. The DMRC (Delhi Metro Rail Corporation), will assist the NMRC over the next one year in operating the Aqua Line. The Aqua line, which will have 19 rakes with 4 cars each, will halt on the Sector 76, 101, 81, NSEZ, Noida Sector 83, 137, 142, 143, 144, 145, 146, 147, 148, and Greater Noida’s Knowledge Park II, Pari Chowk, Alpha 1, Delta 1, GNIDA Office and Depot metro stations. The trains are designed to run at a maximum speed of 80 kmph, clocking an average speed of 37.5 kmph. Seat reservation through different colours has been done in the coaches for ladies, senior citizens and differently-abled persons. According to officials, a dedicated space has been provided for wheelchair in driving trailer cars at both the ends of the trains. Last year in December, the NMRC had announced fares for the Aqua Line, with the minimum being Rs 9 and the maximum Rs 50. Commuters can buy QR-coded paper tickets or use the smart cards to get 10 per cent discount on fares, the officials said.